The evening started with networking of about 45 women representing different organisaiton exchanging greetings, introduction, thoughts, etc. 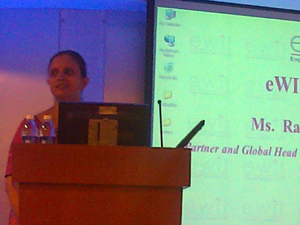 The event started with Ms. Kalyani, President of eWIT welcoming all and briefing audience about eWIT and its activities. After which she invited Ms. Indira Viswanathan, Exec Committee Member of eWIT to introduce the Role Model of the evening. 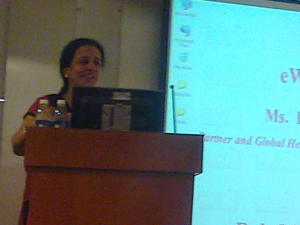 Ms. Indira Viswanathan introduced Ms. Rama Sivaraman, the speaker of the event and invited her to take over the Dias. Ms. Rama Sivaraman started her speech narrating how she was brought up in her childhood without parents being around, with her younger brother and managing household and school, etc. When Ms. Indira Viswanathan asked her how she manages being in a higher position, member of the management committee that is dominated mostly by men, Ms. Rama said she would not think men as a different gender from hers but treat them as a fellow member. She opinioned that this has been seeded from her childhood because of her schooling in a co-education school. she narrated how those women were brave enough to come out of their comfort zone and take a risk in their career. She explained her challenges faced in her personal life when she had to get a critical contract signed from a customer. She asserted that everyone will face challenges in their formative period of career. Even at times of a career break, staying in touch with technology helps to get back to work easily, and cope up with changed technology.’ She stated that when there are choices to make in household, she always preferred to be with her kids. She said to remotely monitor safe internet use by kids, she had always used net nanny. .She challenged when managing team at office is possible for women, it should be possible at home as well. She further added women are inclined to leadership skills such as trust, empathy, mentorship, time management, resource management etc. naturally and hence they are naturally suitable for top management positions. She requested youngsters to be focused on what they want to be. She asked them to set up a benchmark and slowly sail towards it with a focus, if they want to be in top management. During the Q&A session, when asked about perception management, Ms. Rama said women are much better at perception management than men. She also mentioned that women tend to finish their work and rush back home, but never try to spend time in talking to colleagues, outside meetings. It is very important to network, and have offline chat with colleagues, beyond middle management and above levels. This is something the men do very well, and gain the advantage of such networking. The evening ended with a thank you note by Ms. Indira Viswanathan of Hexaware Technologies and Exec Committee member of eWIT. The venue of the event was hosted by Exemplarr Worldwide, a corporate member of eWIT.